Tulane unveiled sharp, new throwback helmets Tuesday, with make use of a classic Green Wave logo. Though it’s a look that’s been done before, the buzz generated around college football social media and websites demonstrates the love fans have for a good, old-school look. The following programs should follow Tulane’s lead with a regular throwback helmet added into the rotation. 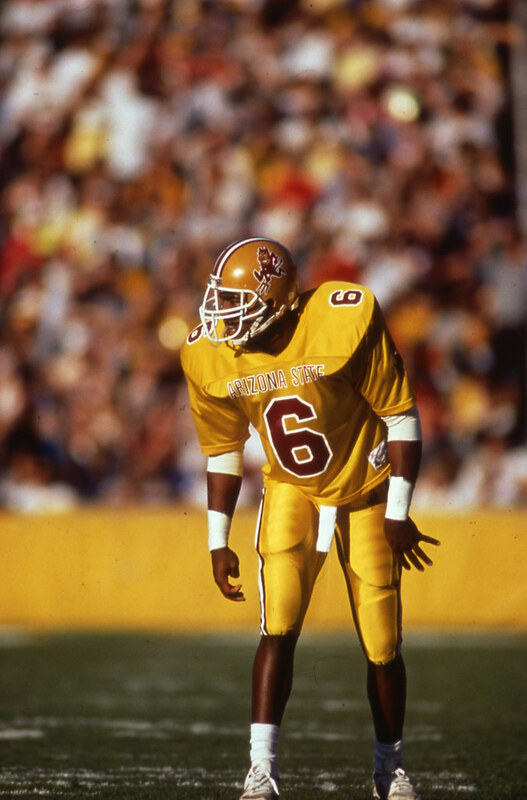 Arizona State’s only a half-decade into a rebranding that including a move away from the standard, yellow helmet, which had been as much of a standard in Tempe as spending an evening on Mill Avenue. Since abandoning Sparky in 2011, Arizona State brought him back for the 2014 Territorial Cup matchup with rival Arizona. ASU lost, which might put the throwback helmets on the shelf for awhile. Defeats in the Duel in the Desert typically relegate alternative duds to the closet — just ask Arizona State’s all-yellow uniform or Arizona’s copper helmet. If the Sun Devil equipment opts not to reintroduce Sparky for awhile — let him regain his mojo — perhaps Arizona State should bring back the seldom-used sunburst logo for a night. The purple-accented silver helmet is as synonymous with K-State football as the pullover is with head coach Bill Snyder. The Wildcats have worn the same helmet since 1989, making the current incarnation a throwback helmet in and of itself. That silver lid with a purple wildcat logo need not be abandoned, nor changed. However, there’s no harm in introducing some real throwback flavor to the mix. Let’s take Manhattan back to the 1970s for a weekend and bring back the below, purple-and-white cap with a much different style of wildcat. Since Under Armour adopted its home-state program as its test fashion plate, Maryland’s trotted out roughly 67 different helmets — and not a one featured the most unique animal mascot in the FBS. In fact, the terrapin’s been used shockingly seldom in the history of Maryland football. Under Armour needs to rectify this quickly. A straight-up throwback to the 1970 look may not exactly be welcomed with open arms. Maryland still did crab cakes then, but a 2-9 record suggests it wasn’t quite as hip to football at the time. The exact 1970 helmet may not make a comeback, but a modernized variation should make use of the terrapin logo. If you’re mantra is Fear The Turtle, let’s see what we’re fearing. As you might have guessed from the above entries, I’m a bit of a mark for mascot logos. Thus, I find Ohio eschewing its own, very cool mascot logo on its football helmet in favor of block letters spelling out the state name. There’s nothing wrong with the simplicity of Ohio’s helmet, though it does look a bit goofy when paired with sharp, black alternate uniforms. Ohio’s equipment team solved that with a matte black lid, though kept the dark-green OHIO block lettering logo. A prime opportunity to integrate a stylish logo was missed. The Pittsburgh athletic department gradually integrated the university’s classic script logo, making the change complete and official last month. The 2016 football is thus a most opportune time for the Panthers to don throwback helmets, fully embracing the return of imagery from their dominant, early 1980s run. In those days, Pitt wore a more yellow than gold helmet with a matching face mask. Such a look is virtually nonexistent in college football today. The perfect game to unveil this look: Week 2 against Penn State. Consider it the 2016 Panthers looking to make good for the only game the 1981 Panthers lost en route to the Sugar Bowl. UCF football hasn’t existed but 37 years, and the Knights have worn the same white lids with black-and-cream soda gold accents for the past decade. The still-burgeoning program doesn’t have an extensive cache of throwback helmets, but one look from its history worth revisiting features the Sunshine State. This is noteworthy, as in-state counterpart FAU debuted a helmet similar to the below this past season. With Florida evolving into a competitive grounds for fledgling programs, planting a stake in the state by any means possible goes a long way.